I'll admit it, 2012 was kind of a craptastic year for me and my only hope for 2013 was that it would be marginally better. But like the wise Rachel Hawkins recently said of herself, I decided to chalk 2012 up as a "learning year" and made some changes--both big and small. And you know what? 2013 has turned out to be pretty darn great! A time filled with good physical and mental health, true friends, amazing family moments, and even a few end of year surprises that were the chocolate shavings on top of an already pretty sweet year. So if for you 2013 has been the equivelant of crap on the bottom of your shoe, I'm a walking testament as to how quickly your fortune can turn around if you keep moving forward. 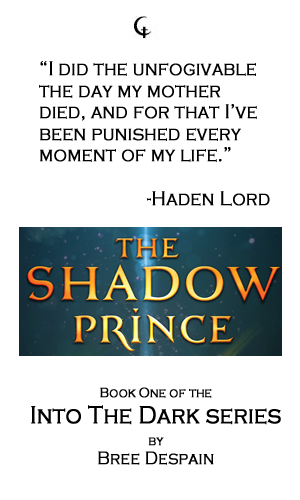 I'm hoping that with the release of THE SHADOW PRINCE that my 2014 will be an even better year! Speaking of end of year surprises . 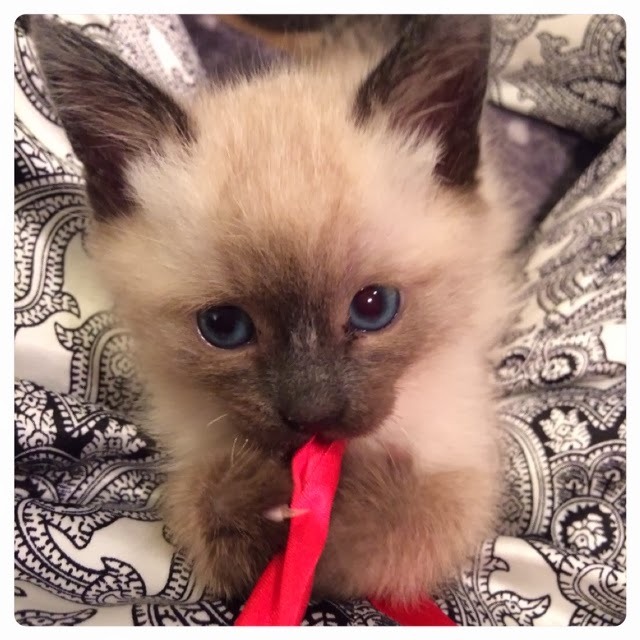 . .
Mei Mei the Christmas Kitten! You have no idea the amount of joyful squeals that have been going on over here while playing with this little cutie. Okay, I'll stop teasing you all with Mei Mei's cuteness and move on to the real business . . . .
Today's teaser is extra special because it involves a song. Not just any song, but the song that was the very first inspiration for this book: "I Will Follow You Into The Dark" by Death Cab for Cutie. If you're not familiar with the song, you should have a listen by clicking here. I was kind of obsessed with this song back in 2006--as in played it on a loop incessantly--and the lyrics really got me thinking and about who would do such a thing. Follow someone into to the dark--or the unknown, as I like to think of it. Which then reminded me of the myth of Persephone and Hades, which then got me thinking about the relevance of their story in our modern time, which got a couple of characters talking in my head, and a story started forming . . . and several years later it is now a book! 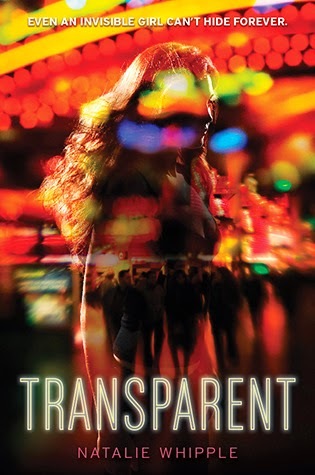 To help spread the word my fellow Utah author Natalie Whipple's new book BLINDSIDED, I am giving away a signed copy of TRANSPARENT (book one) to a lucky winner. This book is about an invisible girl who is on the run from her mob boss father who wants to turn her into an assassin--and it so much fun! Definitely one of my favorite reads of the summer. I can't wait to get a copy of the sequel, BLINDSIDED, this week! Merry Christmas to all those who celebrate, and a happy quiet day to all those who don't. Since it's Christmas Eve and most a super busy with their family or friends, I'm not going to post a new teaser today. But don't worry, I'll return us to our regular schedule next Tuesday--maybe with an extra juicy teaser for you all. Just popping in to wish everyone a happy holiday, and to post the winner of last week's giveaway. I know it's late in the day, but it's STILL Tuesday, so that means it's time for another teaser from THE SHADOW PRINCE. But first, I must announce the winner of Teaser Tuesday #1. Drum roll please . . . . I've often said that THE SHADOW PRINCE is a crazy-fun mish-mash of all the things I love, rolled together with some Bree Despain-style romance. This is especially true when it comes to Haden Lord--the disgraced prince of the Underrealm and one of the book's main characters. So today I thought I would share with you my inspiration board for Haden--featuring a few of my favorite fictional hotties. CLICK HERE TO SEE MY HADEN LORD INSPIRATION BOARD ON PINTEREST. I was privileged enough to get a signed ARC or DEFY from my friend Sara B. Larson. I read it (and it's awesome, by the way) and now I have her permission to give my copy away to one of you! ***Contest is open internationally. Winner will be announced next Tuesday. Winner must claim their prize within 30 days or it will be forfeit. ****Winner, if you did not receive my email, hit the contact button above and send me your shipping address so I can send out your prize. 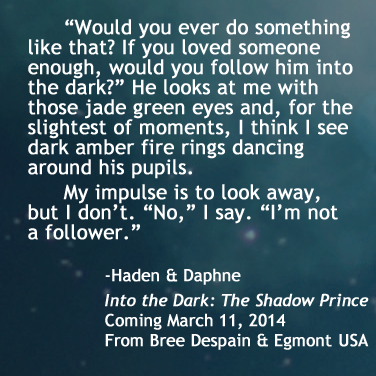 You guys, we are only 3 months of Tuesdays away from the release of THE SHADOW PRINCE on March 11th, 2014!!! To celebrate, starting today and then every Tuesday until launch, I am going to host THE SHADOW PRINCE TEASER TUESDAY in which I will be posting special teasers like snippets from the book, pictures or Pinterest boards of people or things that inspired the story/characters, and even a few fun videos. And since no celebration is complete without prizes, we'll even have a bunch of those, too! To kick off our very first Teaser Tuesday, I thought I would start with one of the most important parts of the book--the first line. Would you believe that I wrote 24 different openings to THE SHADOW PRINCE before landing on just the right one? Good then, because it was actually 28! But then the perfect line came to me--in the shower of all places--and everything started to click into place: character, setting, word-building, stakes. It was the line that prompted a dozen questions in my head, and finding the answers became a book. And as some of you might have noticed, there's a double teaser in that image. THE SHADOW PRINCE is going through a cover redesign, and while I can't show you the whole thing yet, I got permission to show you the little teaser snippet of the title treatment above. Isn't it stellar? Enter to win using the Rafflecopter below, and be sure to come back every Tuesday until March 11th to get more teasers and enter to win more prizes! And feel free to grab the teaser image and share it on your blog, tumblr, pinterest, wherever! *** Contest is open internationally. The winner will be announced next Tuesday. Prize must be claimed within 30 days or will be forfeit.